To Cite: Bankaoglu M, Soydan Mahmutoglu A, Celebi I, Tugrul Eren O, Erturk S M, et al. Association of Iliotibial Band Friction Syndrome with Patellar Height and Facets Variations: A Magnetic Resonance Imaging Study, Iran J Radiol. 2018 ; 15(1):e63459. doi: 10.5812/iranjradiol.63459. Objectives: The aim of the study was to evaluate magnetic resonance imaging (MRI) findings of iliotibial band friction syndrome (ITBFS) and its association with patellar height and facet shape variations. Patients and Methods: Forty-one knees of 32 patients (14 female, 18 male) referred from the orthopedic surgery outpatient clinics with the MRI diagnosis of ITBFS composed the study group. Thirty two knees of 29 patients (13 female, 16 male) with MRI records without any radiologic findings of knee pathology were chosen as the control group. All of the patients were evaluated by MRI, including the assessments of patellar length ratios according to Insall-Salvati method and patellar facet variations according to Wiberg’s classification. Results: According to Wiberg’s classification, nine knees (21.9%) had type I, 20 (48.8%) had type II, and 12 (29.3%) had type III shape of patella in the study group. Wiberg type I and type III patella ratio in the IBFS group was higher than the control group (P < 0.001, and P = 0.003, respectively). Wiberg type II patella ratio in the IBFS group was lower than the control group (P = 0.006). Ten knees (24.3%) had patella alta and the remaining 31 had patella norma (75.7%) in the study group. The frequency of patella alta was significantly higher in the study group in comparison with the controls (P = 0.002). Conclusion: ITBFS can easily be diagnosed by MRI and it is more likely associated with patella alta and type I and III patella according to Wiberg’s classification. Iliotibial band friction syndrome (ITBFS) is a misuse damage triggered by repeated abrasion of the iliotibial band through the lateral femoral epicondyle (1, 2). The etiopathogenesis of this syndrome is controversial and it is still unclear which tissue is responsible for the inflammatory progression, the bursa or the synovial recess of the knee joint. It was also speculated that the combination of extrinsic factors and intrinsic or anatomical factors may predispose to develop overuse injuries including ITBFS. Malalignment of the lower extremity has been implicated in iliotibial band syndrome (3). Anatomic variations also can be responsible for the development of ITBFS. To the best of our knowledge, there is no published paper that has focused on the association of patellar shape and height with ITBFS. In this study, we aimed to evaluate MRI findings of ITBFS and its association with patellar height and facet shapes. Between 2004 and 2014, 41 knees of 32 patients (14 female, 18 male) with MRI findings diagnosed as ITBFS referred from orthopedic outpatient clinics composed the study group. Thirty two knees of 29 patients (13 female, 16 male) with MRI records without any radiological findings of abnormality were chosen as the control group. As a retrospective study, the right to use clinical records of patients and controls and their MRI findings were approved by the ethical committee of our institute. Patients with signs of ITBFS and additional diseases such as meniscal tears, ligamentous ruptures and apparent cartilage destructions or a history of prior knee interventions were excluded from the study group. Patients who had similar clinical and radiologic findings with ITBFS such as patellar tendon lateral femoral condyle friction syndrome, Hoffa syndrome and suprapatellar fat pad impingement sydromes were excluded from both study and control groups. All of the patients were evaluated by MRI, including the assessments of patellar length ratio and patellar facet shapes according to Wiberg’s classification. The MRIs that were used in this study were obtained by using 1.5-T Siemens MRI Unit (Avanto, Erlangen Germany). Routine knee positioning with 30-degree flexion in supine position and routine imaging protocols were applied to the patients. Axial T2-weighted images with fat suppressions were used to evaluate patellar shapes for Wiberg’s classification and fast spin echo T1-weighted sagittal images were used to classify patellar heights. The patellar alignment was evaluated by using Medi plus Diagno plus viewer DS3000 workstation (Turmap HealthCare, Mortsel, Belgium). Two radiologists, who had 5 and 15 years of experience respectively in musculoskeletal radiology evaluated the MRI data together for both the diagnosis of ITBFS and the measurements by consensus. MRI findings confirming ITBFS were localized fluid collections alongside the iliotibial track in the coronal plane, thickening of the iliotibial band, lateral patellofemoral joint distance reduction in axial plane and lateral movement of the patella. Presence of two or more of these findings besides clinical symptomatology was considered confirmatory for ITBFS diagnosis; whereas, the control group’s MRI findings had no sign of pathology. When a diagnosis of ITBFS was confirmed, patellar shape and ratio of patella height to the patellar tendon were evaluated in the sagittal plane in both study and control groups (Figures 1 and 2). Figure 1. MRI findings of iliotibial band friction syndrome on axial proton density (PD) weighted fat saturation image. The arrows point to thickening of the iliotibial band, decreased lateral patello-femoral joint space, and fair lateral movement of the patella in the axial plane. Figure 2. MRI findings of iliotibial band friction syndrome on coronal proton density (PD) weighted fat saturation image. Arrow demonstrates localized fluid collection next to the iliotibial band. Patellar length ratio (PLR) of the knee at 30° flexion was measured on sagittal MRI images according to the Insall and Salvati method (4). Two lines were drawn: patellar length (PL) -from upper to lower point of the inner surface of the patella excluding osteophytes; patellar tendon length (TL) -from lower inner point of the patella to the highest point of the tibial tuberosity. PLR was calculated as PLR = PL/TL. A ratio lower than 0.8 was considered to show patella baja, while higher than 1.2 was indicative of patella alta (Figure 3) (5). Wiberg’s classification of patellar shapes were detected in axial MR images according to the morphology of the internal aspect of the facet in three types (Figures 4 - 6). Figure 4. Axial proton density (PD) weighted fat saturation image showing type I patella according to Wiberg. The medial and lateral facets of the patella are nearly the same length and concave in shape. Figure 5. Axial proton density (PD) weighted fat saturation image shows type II patella according to Wiberg. The lateral facet is longer than the medial one which is usually concave in shape. Figure 6. 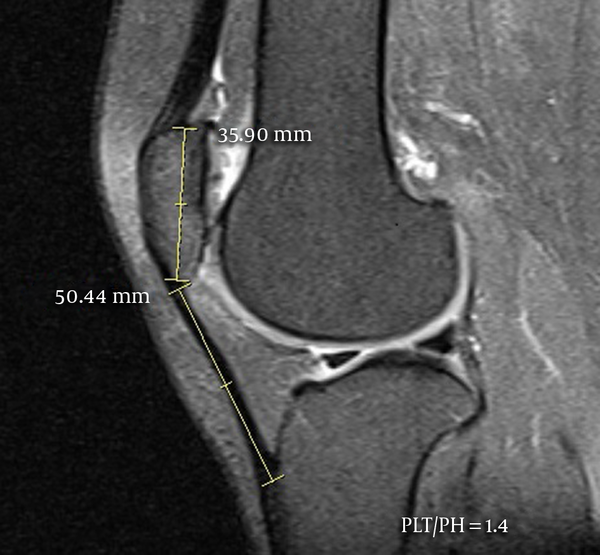 Axial proton density (PD) weighted fat saturation image shows type III patella according to Wiberg. The medial facet of the patella is nearly atrophied compared to the lateral one and both facets are convex in shape. 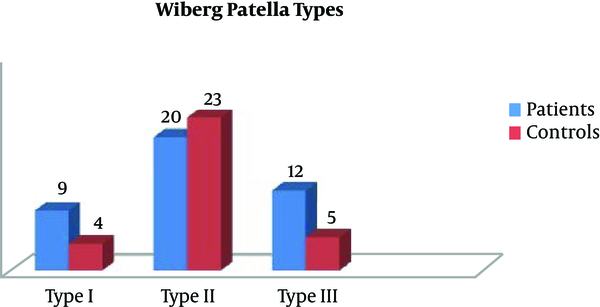 Wiberg types and patellar position ratios were collected for patients and control groups. Fisher’s exact test was used to show association. A level of P < 0.05 was considered as statistically significant. SPSS software was used in the statistical analysis of data (Released 2008. SPSS Statistics for Windows, version 17.0. Chicago, SPSS Inc.). We were not able to reach a perfect match between patients and controls because of the relatively small number of patients with ITBFS diagnosed by MRI and difficulties of finding a real normal knee MRI. Therefore, statistical analyses were limited. The mean age of the patients in the study group was 35.93 ± 9.50 (range, 20 to 55), and the mean age of controls was 34.72 ± 10.02 (range, 18 to 55) years. According to the Wiberg classification, nine knees (21.9%) had type I, 20 (48.8%) had type II, and 12 (29.3%) had type III shape of the patella in the study group. Whereas, four knees (12.5%) had type I, 23 knees (71.9%) had type II, and five knees (15.6%) had type III shape of the patella in the control group (Table 1). Wiberg type I and type III patella ratios in the ITBFS group were significantly higher than the control group (P < 0.001 and P = 0.003, respectively). Wiberg type II patella ratio in the IBFS group was significantly lower than the control group (P = 0.006) (Figure 7). As for the patellar shapes of the patients, 10 knees (24.3%) had patella alta and 31 knees stayed in the normal range as patella norma (75.7%) in the study group (Table 2). Patella baja was not detected in the study group. In the control group, 25 knees (78.1%) had patella norma, five (15.6%) had patella alta, and two (6.3%) had patella baja (Figure 8). The frequency of patella alta was significantly higher in the ITBFS group than controls (P = 0.002). Iliotibial band friction syndrome (ITBFS) is a misuse damage triggered by repeated abrasion of the iliotibial band through the lateral femoral epicondyle (1, 2). ITBFS is commonly observed in bicyclists, marathon runners, commandos, or rangers among the relatively young aged active population (2). Diagnosis is habitually established from a complete medical anamnesis and physical examination (6). Treatment is typically conservative consisting of rest, anti-inflammatory drugs, physiotherapy, steroid injection, and surgical treatment in selected cases (1, 7, 8). 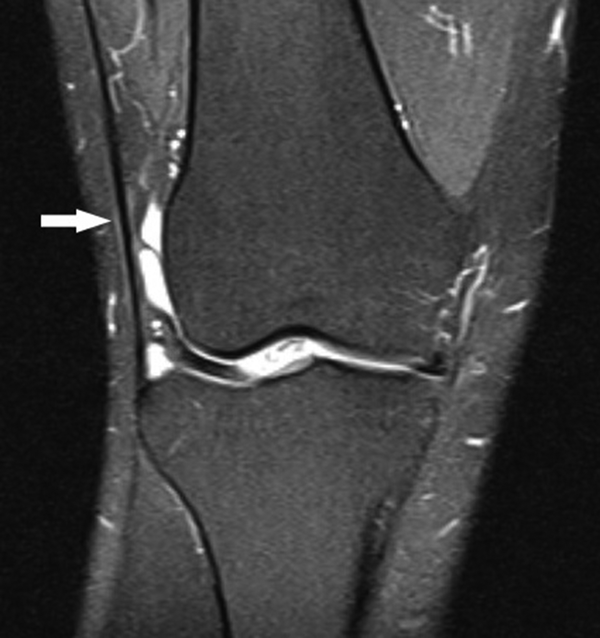 The etiopathogenesis of this syndrome is controversial and it is still unclear which tissue is responsible for the inflammatory progression: the bursa or the synovial recess of the knee joint. Ekman et al. acknowledged ITBFS as a problem in the bursa underneath the iliotibial band using magnetic resonance imaging (2, 6). Histologically Nemeth et al. revealed that the inflamed tissue is the lateral synovial recess of the knee joint (7). It was also speculated that the combination of extrinsic factors and intrinsic or anatomical factors may predispose to develop overused injuries including ITBFS. Malalignment of the lower extremity has been implicated in iliotibial band syndrome (3). In our study, we also found an association between the anatomic factors including facet shape and height of the patella in our study. We used Wiberg classification for patellar facet shape. Wiberg classification of patella was based on differences in facet shape and lengths (4). In Wiberg classification, three types of patella were termed. These shapes can be well-defined in axial MRI planes. In 1941, Wiberg described three types of patella based on lengths of the medial and lateral facets. In Wiberg type I patella has same sized facets medially and laterally, whereas in type II, the medial facet is slightly shorter than the lateral facet, and in type III the medial facet is markedly smaller and has a concave shape. In large-scale anatomic studies, 10% of the normal population has type I, 65% has type II and 25% has type III (4, 9). Stoller et al. 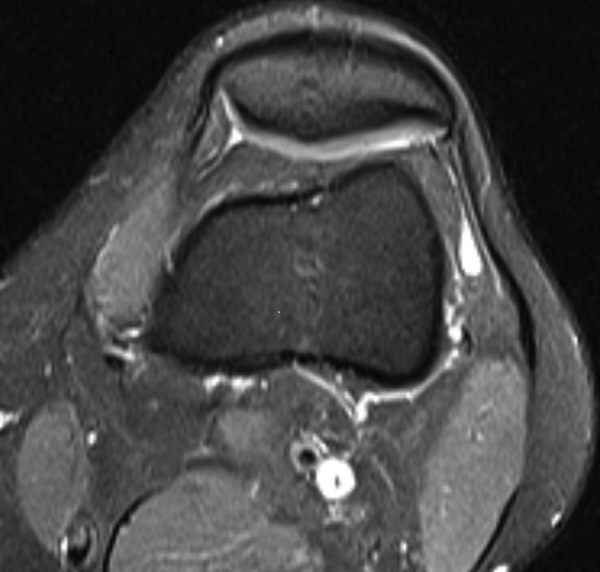 (9) proposed that an inexplicably short medial facet predisposed the patella to chondromalacia patellae. They described that the small area of contact between the medial facet of the patella and the medial femoral condyle led to increased stress on the medial articular cartilage of the patella during physiologic motion. In our study Wiberg type I and III patella were significantly higher in ITBFS group whereas type II was significantly higher in control group. 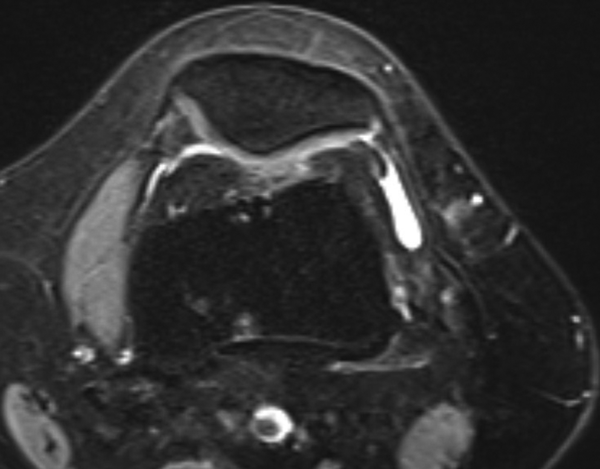 Thus we thought that facet shape of patella could be associated with ITBFS. In our study we used Insall - Salvati ratio for detection of patella height. Insall and Salvati described the patellar tendon - patella ratio as the ratio of maximal length of the patella to the distance from the distal tip of patella and the tibial tuberosity, which is normally between 0.8 and 1.2. Patellar positions above and below these ratios are called patella alta or patella baja, respectively (9). Shabshin et al. (5) used MRIs of extended knees to measure the PLR and suggested that PLR of > 1.50 or < 0.74 defined patella alta and baja, respectively. Barbier-Brion et al. (10) showed that patients with patella lateral femoral friction syndrome (PLFFS) have anatomical predisposition for instability with patella alta (P < 0.0001). Patella baja has been related with quadriceps tendon rupture, neuromuscular disorders, and post-surgical advancement of the tibial tuberosity (11). Patella alta is associated with lateral patellar dislocation, chondromalacia patellae, patellar ligament rupture, patellar and quadriceps tendonitis. In our study, there was a strong association between patella alta and ITBFS suggesting that patella alta may become provocative and take role improving pathology in the knee. The diagnosis of ITBFS usually depends on clinical signs and symptoms. Anterior knee pain and pain in motion are the major symptoms (1, 2). Magnetic resonance imaging is necessary to show pathological findings and to exclude other reasons that may cause similar symptoms (6). Ultrasound has minor role in imaging but can be useful for follow up once the diagnosis is made (12). Vasilevska et al. (13) studied 128 patients to assess the frequency of MRI signs of ITBFS in patients with advanced medial compartment knee osteoarthritis and stated that ITBFS frequently (74.2%) accompanies osteoarthritis of the knee. Their model was that decreased medial joint space created a varus knee deformation, hence putting additional tension to the iliotibial band. They defined MRI findings of ITBFS including poorly defined abnormalities of signal intensity and localized fluid collection lateral, distal or proximal to the lateral epicondyle, and signal intensity abnormalities superficial to or deep by the iliotibial band. We used MRI findings confirming ITBFS including localized fluid collection, thickening of the iliotibial band, lateral patellofemoral joint distance reduction in axial plane and lateral movement of the patella. As far as we know there is no data regarding size criteria for iliotibial band thickness. Thus, we evaluated the thickness of iliotibial band subjectively. This was the first limitation of our study. In addition, our study had other limitations including the small sample size, and retrospective structure. In conclusion, ITBFS has some objective imaging criterions in MRI and may be associated with internal or anatomic factors including patellar shape and height. ITBFS is more frequently accompanied with patella alta and type I and III patella according to Wiberg classification. 1. Noble CA. The treatment of iliotibial band friction syndrome. Br J Sports Med. 1979;13(2):51-4. [PubMed: 465909]. 2. Renne JW. The iliotibial band friction syndrome. J Bone Joint Surg Am. 1975;57(8):1110-1. [PubMed: 1201997]. 3. Krivickas LS. Anatomical factors associated with overuse sports injuries. Sports Med. 1997;24(2):132-46. [PubMed: 9291553]. 4. Insall J, Salvati E. Patella position in the normal knee joint. Radiology. 1971;101(1):101-4. doi: 10.1148/101.1.101. [PubMed: 5111961]. 5. 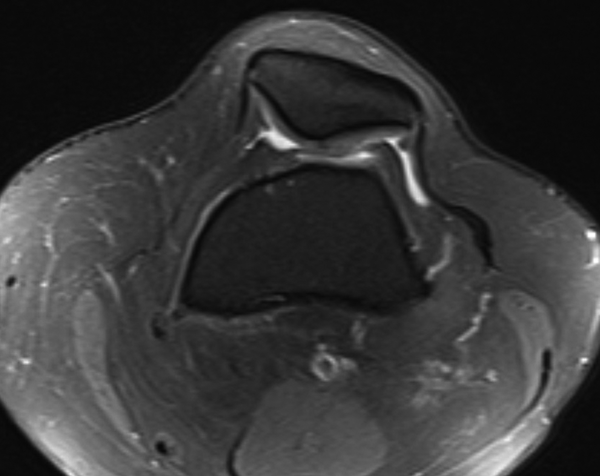 Shabshin N, Schweitzer ME, Morrison WB, Parker L. MRI criteria for patella alta and baja. Skeletal Radiol. 2004;33(8):445-50. doi: 10.1007/s00256-004-0794-6. [PubMed: 15221214]. 6. Ekman EF, Pope T, Martin DF, Curl WW. 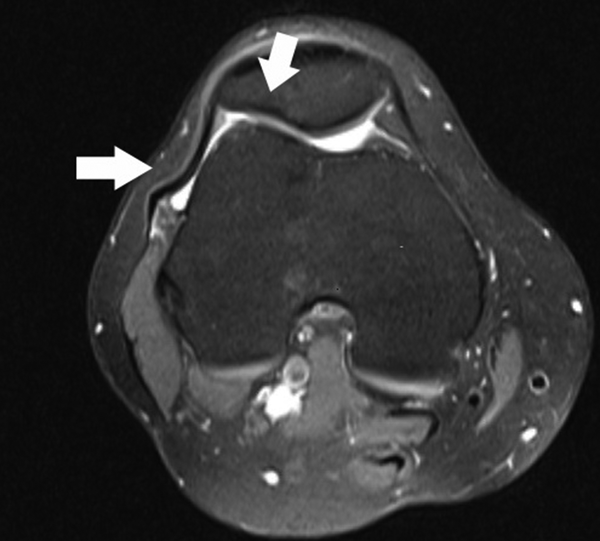 Magnetic resonance imaging of iliotibial band syndrome. Am J Sports Med. 1994;22(6):851-4. doi: 10.1177/036354659402200619. [PubMed: 7856812]. 7. Nemeth WC, Sanders BL. The lateral synovial recess of the knee: anatomy and role in chronic Iliotibial band friction syndrome. Arthroscopy. 1996;12(5):574-80. [PubMed: 8902132]. 8. Gunter P, Schwellnus MP. Local corticosteroid injection in iliotibial band friction syndrome in runners: a randomised controlled trial. Br J Sports Med. 2004;38(3):269-72. discussion 272. [PubMed: 15155424]. 9. Stoller DW. Magnetic resonance imaging in orthopaedics and sport medicine. 1. 3rd ed. Lippincott Williams & Wilkins; 2008. p. 584-5. 10. Barbier-Brion B, Lerais JM, Aubry S, Lepage D, Vidal C, Delabrousse E, et al. Magnetic resonance imaging in patellar lateral femoral friction syndrome (PLFFS): prospective case-control study. Diagn Interv Imaging. 2012;93(3):171-82. doi: 10.1016/j.diii.2012.01.005. [PubMed: 22421281]. 11. Noyes FR, Wojtys EM, Marshall MT. The early diagnosis and treatment of developmental patella infera syndrome. Clin Orthop Relat Res. 1991;(265):241-52. [PubMed: 2009665]. 12. Jelsing EJ, Finnoff JT, Cheville AL, Levy BA, Smith J. Sonographic evaluation of the iliotibial band at the lateral femoral epicondyle: does the iliotibial band move? J Ultrasound Med. 2013;32(7):1199-206. doi: 10.7863/ultra.32.7.1199. [PubMed: 23804342]. 13. Vasilevska V, Szeimies U, Stabler A. Magnetic resonance imaging signs of iliotibial band friction in patients with isolated medial compartment osteoarthritis of the knee. Skeletal Radiol. 2009;38(9):871-5. doi: 10.1007/s00256-009-0704-z. [PubMed: 19484234].